HiR Information Report: Open Source... Bicycle Parts?! Okay, I'll admit that my inner cyclist is a little giddy about this. 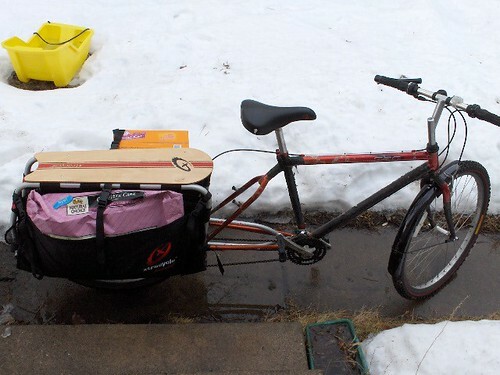 While it certainly isn't programming or security related, it squarely falls into "other interesting topics" and the Xtracycle guys undoubtedly operate with a "hacker" and "maker" kind of attitude, all the while embracing sustainability and empowering others to use human powered machines for tasks that would previously require a car. The initial premise, realized almost a decade ago, was to build an extension frame that would bolt up to a plain old bicycle and move the rear wheel back quite a ways while adding structure and attachment points to support weight-bearing bags and platforms. They're using a Wiki to collaborate right now (and I should note that it's not working all the way yet). I'm not sure I'm ready to sell my car and break out the torch to weld one of these up myself yet, but it's a fascinating project, and it's the first time I've seen this kind of detail in their design.